Every so often a wine stands out from the rest – this was one of those. Rostaing, is a ‘classicist’ when it comes to wine styles, so, when added to his ‘most favourite vintage of the last twenty years’ (2010), the resultant flavours are really memorable. Robert Parker gave this wine 94 points (we found this out after we tasted it) but it is easy to see why. 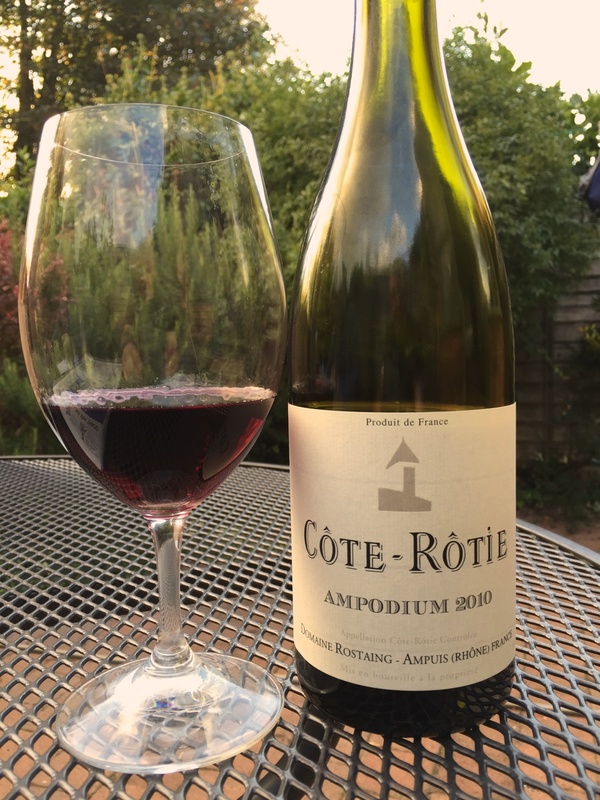 The wine is Rostaing’s Cote Rotie Ampodium – a blend from different sites in the northern Rhone region – but 100% Syrah. The ABV was 13.5%. The colour was a deep red with a pronounced purple rim. It had a fabulous nose of white pepper – initially – but then developing into lighter, red fruits, especially raspberries. There was nothing clumsy or big about this, the delicacy was delightful. It was a wine you could smell all day and still find something new to comment upon. Personally, this was my style of Syrah/Shiraz wine. Not too alcoholic, no final taste of sweetness and so complex in all it had to offer. We had an interesting discussion about food matching and ‘no big flavoured food’ was the result. “Richard’s Last Hurrah ?” I’ll let him explain that. One thing you learn about wine blogging – take notes. Geoff often does, I never do, so this post will be rather light on detail. Both our partners were away last Sunday so Geoff invited me round for a meal. A sunny afternoon so we sat in the garden and warmed up, so to speak, with a glass of fino – Waitrose Fino del Puerto. The best of the supermarket own brands we always think. The wine with the first course was an old favourite, Vina Gravonia from Lopez de Heredia in Rioja. These makers are the oldest of old school and make white wines built to last. We drank the current release, the 2004 which gives you an idea. Only 12.5%, but full of power and finesse, yet fresh and delicate. An unmistakable taste (and nose) which went superbly with clams and lobster tail in a tomato paprika sauce. Next was steak with béarnaise sauce and sauté potatoes. Had to be claret so we moved on to a Graves, Domaine de Chevalier 2002 (from WS, hard to price since part of a DdC mixed case but I’d guess around £35). I rarely drink Bordeaux wines now, Graves even less, but this was very good. A classic nose followed by a taste that didn’t prove disappointing as has happened too often with claret in the past. Lots of length, sweet with integrated tannins. About two thirds cabernet, one third merlot. Wish I had some more. I can’t resist puns, obscure references and just plain silliness. The winemaker Albert Boxler from Niedermorschwir in Alsace produces wonderful wines and we tried to track him down during Easter of 2013. We called twice at the premises – to no avail – but managed to locate a Boxler grubbing up Riesling vines on the hillside outside the village. It could have been Albert, or another relative, but it gave us an insight into the demanding life of a winemaker on these steep slopes of marl. He was certainly standing and clearing, however. 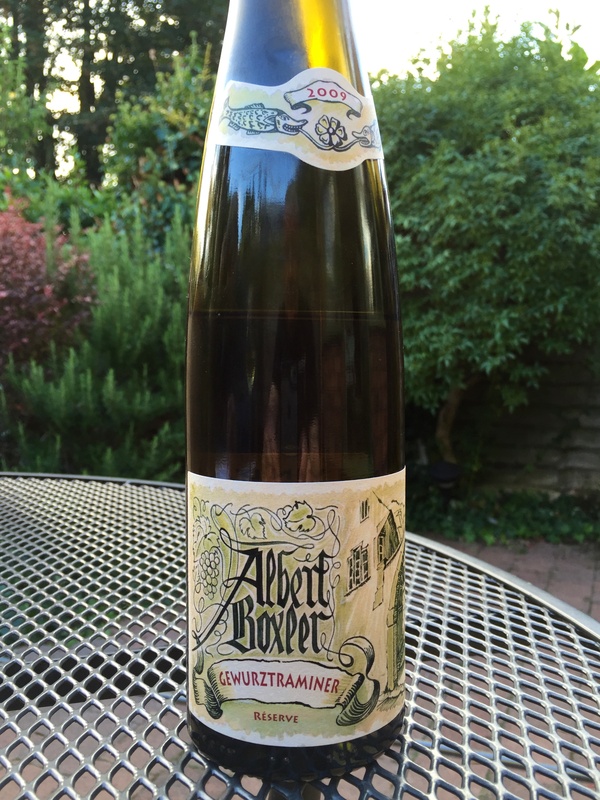 Richard produced Albert Boxler’s Gewurtztraminer Reserve 2009 vintage (£22) which had a beguiling subtlety about it. The nose was not overladen with lychees and rose petals or the Turkish Delight trademarks of the grape but was quite muted with faint raisin aromas. The colure were yellow and deep with no hint of green. The was a rich wine, dry with a lengthy finish and definitely not flowery or overly aromatic. There was a refreshing acidity, a slight marmalade-like taste but it had a distinguished quality that demanded respect. It hadn’t got the rather flabby, obvious, too-eager-to-please characteristics of other Gewurtztraminers but stood firm and powerful. It would be a wonderful accompaniment to Munster cheese or a smoked dish so typical of the region. Richard is not a big G. fan but this wine convinced him of the varieties’ qualities, unfortunately relegating Pinotage to the bottom position. I’ll let him explain that. … thus wrote the winemaker at the bottom of the back label of this weighty white from the Rueda DOC in northern Spain. 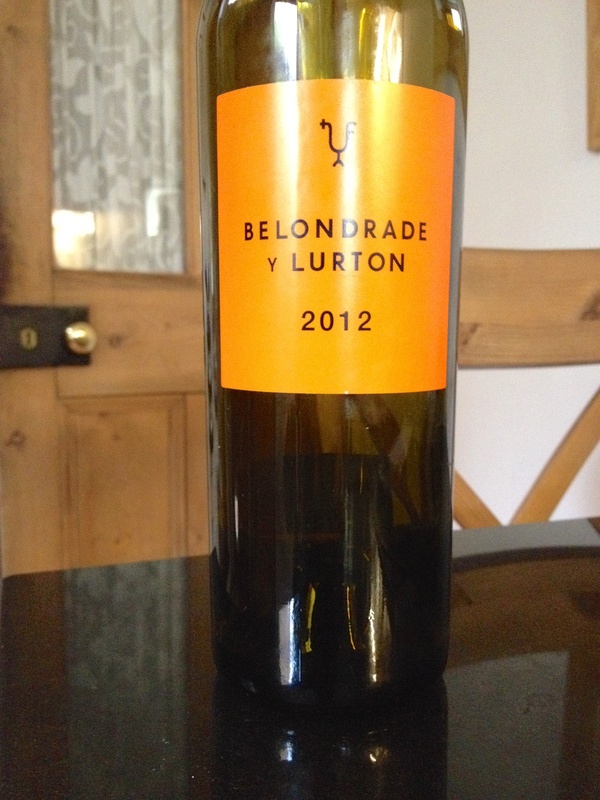 This was Belondrade y Lurton 2012 (13.5% ABV). Spain is currently delivering lots of interesting wines, founded upon grape varieties that had previously been forgotten, considered non-commercial or just side-lined in favour of the international celebrity names. The Verdejo grape originated in Rueda but, post-phylloxera, was replaced with higher yielding varieties. However, its high glycerol and structure means the potential to mature into a full flavoured wine with a lovely mouth feel. The colour was a very clear bright lemon yellow with no green tints but evidence of the glycerol in its pronounced windows. The nose was not particularly strong in fruit or floral notes but was fresh, clean and the acidity was evident. The palate was rich, long and dry – but not bone dry. The acidity gives it a refreshing quality and helps balance the firm weightiness. I detected a nettle-like freshness but, as Richard said, it’s not often you taste nettles. This is a wine with some gravity and is big in the mouth. A serious dollop that developed in the glass. Decanting recommended – which is where we came in. 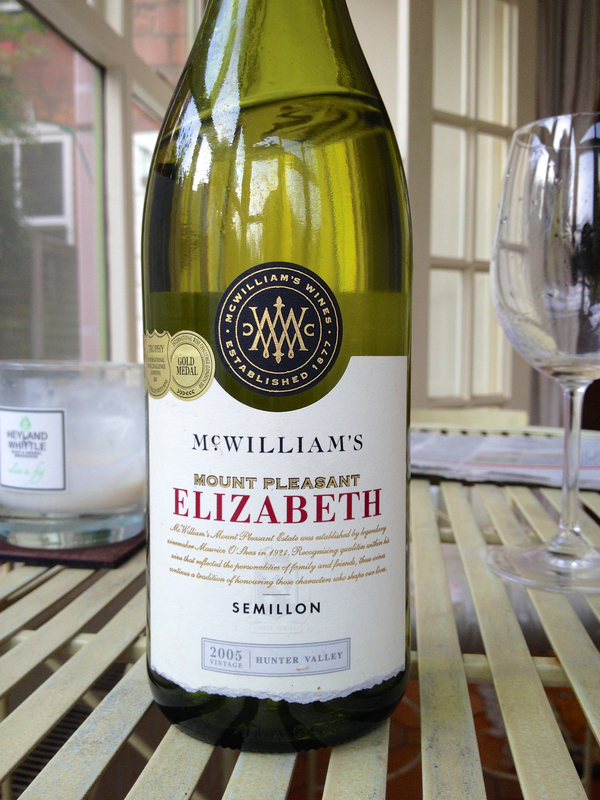 The McWilliams Mount Pleasant Elizabeth 2005 Semillon from the Lower Hunter Valley in New South Wales is a noted wine; mentioned in many books as being a fine example of a Semillon. At only 12% ABV it is not a wine of great power but we were both surprised by how little it had. The colour was a fluorescent green and it appeared to have little weight. Its nose was strongly lime with a touch of smokiness and white stone fruits in the background. This suggested a big, flavourful wine and we looked forward to the taste. And yet … it seemed lacking. There was minerality and quite a pronounced acidity, almost mouth-puckering but the mid-palate was short on flavour. Wanting to understand this wine, I then started researching the vintage – 05, excellent to superb – and its drinking windows. It appears that it needs 10 – 20 years before the ‘battery acid’ flavours (Michael Hill Smith) develop a toastiness and depth, rather like a Riesling’s drinking cycle. We seem to have taken this too early but, fortunately, I still have two more which will now be consigned to some corner for another five years. Watch this space! 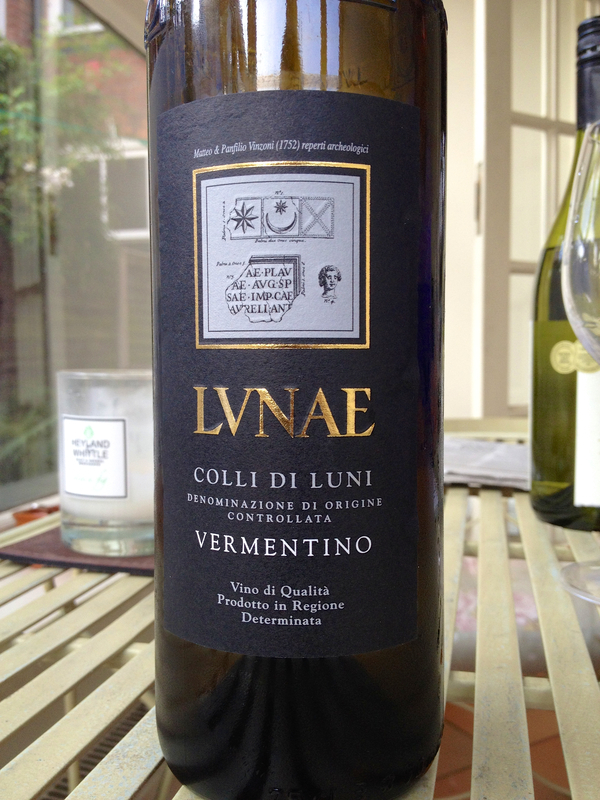 The first of two wines we tasted on Sunday night came from a grape we hadn’t a lot of experience of – the Vermentino. Its origins are Mediterranean but could be Greece, Spain or Italy but all references generally agree on its aromatic qualities. This wine was from the north west of Italy, abutting the Tuscany region, in the Italian Riviera. It was the Liguria di Levante Colli de Luni DOC 2013 (13%), made of 90% Vermentino grapes. It had a very pale green colour and even a slight spreckle was evident; there was also the evidence of weight in the wine, from the legs that slid down the glass. The aroma was certainly attractive and delicately floral with notes particularly of gentle elderflower blossom. The palate was long with clean lines but medium-weight, the fruit being balanced by a chalkiness and minerality which made it refreshing. It was an obviously well-made wine and, like most coastal region wines, would be a great accompaniment to fish dishes. I thought it had the qualities tasted in Vinho Verde – a pleasant, easy drink which was well worth the £13 cost price. Geoff and I went to a Wine Society tasting of South African wines on Monday. Held in a large room at the Burlington Hotel in Brum, you walk round and taste as you choose from about 30 wines. Unusually there were lots of producers presenting their wines – a big SA trade fair in London had brought them over. These tastings (we’ve been to four, I think) always follow the same format. We taste – Geoff white then red, me – expensive then cheaper. After about half an hour a WS employee does an ‘introduction’ with many statements of the ‘bleedin’ obvious’, like ‘there is water in the centre of the room’. Then the buyer says a few words which in this instance consisted of several variations on the theme of ‘thank you for coming’. When that’s over we stop shuffling our feet and get back to the tasting – except that, there wasn’t much to taste. I’d hoped to try a good pinotage (aka, by me, as the ‘red gewurtz’), a grape the taste of which I’ve never liked. There were only three available and I went for the 2009 – not for me. The producer (from Kanonkop) was candid enough to admit that pinotage needs age but the WS don’t stock any old vintages. One curious feature of the WS South African list is that there are no mature wines of any description on sale. A few 2008’s is all. Another is that The Chocolate Block was available to taste but is not on the list either. As well as the pinotage I also tried a decent Burgundian-style chardonnay and a similar pinot. Some Rhone look-a-likes only not as good. A pleasant dessert wine. But that’s it. Nothing I remotely felt like buying. I’m not totally convinced by the ’terroir’ argument but I’d didn’t get any sense of place – as you would with, say, Rhone or Languedocian wines. All this is a prelude to tonight’s wine. No Geoff this Friday evening but I thought I’d try one of my vast stock (was 3, now 2) of South African wines. 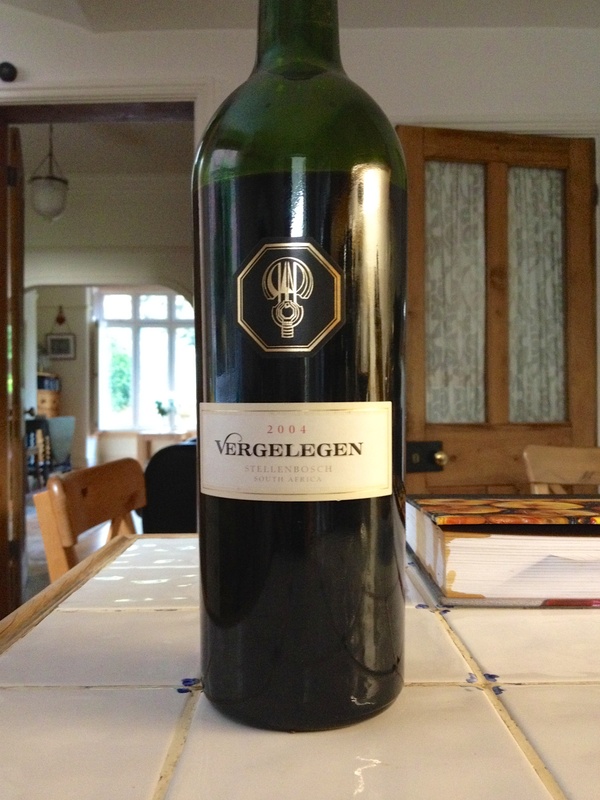 So, I opened a 2004 Vergelegen (14.5%) which members on Cellartracker suggested was either ready to drink or completely past it, depending on the reviewer. From MWW, about £25. I think it is 80% CS, 16% Merlot, 4% Cab Franc but Vergelegen do so many ranges with differing logos over the years, it is hard to be sure. Certainly a cassis nose, rather rustic – some pinotage in there? Deep red colour, strong persistent taste, obviously CS dominated. Actually not bad, certainly ready to drink with a few years left. But I think I’d rather have a £25 Bordeaux. All this has got me wondering – why don’t I buy South African wines? Is it a residual dislike from the apartheid era, which I’m old enough to remember? All the producers present on Monday were white, needless to say. Or is it that the wines are just, for the most part, ordinary. Bit of both probably. Geoff here. Enjoyed reading my tasting mate’s blog, mostly echoing what we thought and discussed on the evening. As a general comment, the whites I tried – Semillon, Chenin, the blends, Sauvignon – had finesse and subtlety but possibly lacked intensity of flavour. I theorised (always doing that, sorry) whether the grapes are not allowed to hang too long – because of the heat – and don’t develop to full potential. I’m sure someone more knowledgeable than me will shoot me down for this comment. Please do. The Ham. Russell Pinot was lovely, firm but still attractively forward. Tasting was slightly underwhelming for me and the attendance was lighter than previous events.